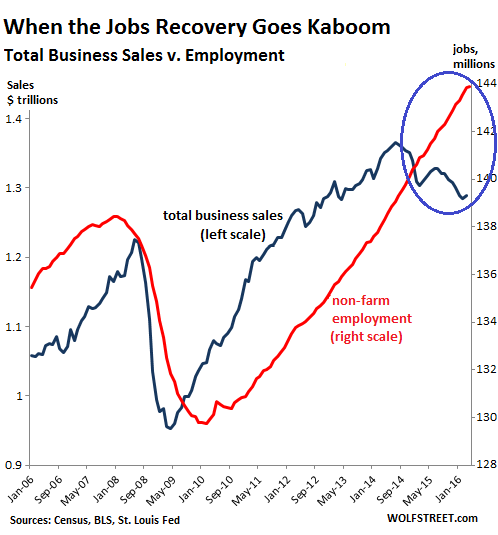 Wolf Richter: What Makes This Jobs Report So Truly Ugly? Yves here. Even though the crappy jobs report on Friday has been well chewed over, I thought Wolf provided a helpful recap, particularly for those who like digesting information after the insta-reaction phase has passed. Even Brookings admitted it could not successfully apply porcine maquillage to the data. Putting aside Lambert’s and my Maine bear proclivities, he and I have both had trouble for the last few months reconciling the weak shipments data (not just at ports but via other modes of transport) and wage growth out of synch with the supposedly good employment numbers. With the revisions and the latest report, the picture makes more sense. While a visibly weak economy is in theory bad for Team Dem, the economy has long been mediocre to bad for the bottom 80%, so I doubt the jobs data makes much difference to their perception of things. But it does dent a (not very convincing) Democratic party claim regarding its stewardship (let us not forget that Clinton is presenting herself as a true heir of Obama and earlier Clinton policies). Oddly, the weak report may have saved the Democrats from an even worse fate, that of a June interest rate increase by the Fed. Many observers attributed the market turmoil in January as the result of the Fed’s action (many institutional investors limit their trading as of December 15 or so to make the year-end closing easier). Recall that Sanders big gains came when Wall Street was rocky. My guess is that the upheaval reminded too many observers of the damage that 2008 had done, as well as the failure to hold anyone in a position of authority accountable or put in strong enough reforms to prevent a recurrence. It would have been nice if we’d been correct to the minute, but we were two months early, and therefore wrong, when we wrote on March 30, If This Plays Out, Friday Will Get Ugly. But it did play out today. At the time, we suspected that the March jobs report, released in early April, would be a debacle. We based this on an analysis of the divergence over time between the reports issued by payroll processing company ADP and the jobs reports issued by the Bureau of Labor Statistics. That divergence had been going on for months. Eventually it reverts to the mean. We postulated that March would be that month. Instead, it happened two months behind schedule, so to speak, as today’s jobs report was precisely that sort of debacle. The Labor Department was expected to report, according to Wall Street economists, a “moderate” gain of 158,000 jobs in May, “moderate” given that the Verizon strike kept 35,000 workers off their jobs. The “whisper number” was around 200,000 jobs. The BLS reported that the economy had added 38,000 jobs, the lowest since September 2010. Furthermore, the April job gains of 160,000 were chopped down by 37,000 and the March job gains of 208,000 were chopped down by 22,000. Hence, with 59,000 jobs revised away, and with only 38,000 jobs “created” in May, the net total in today’s report was a net loss of 21,000 jobs. We haven’t seen that since the Financial Crisis. “Shockingly weak,” and “In one word, ‘Ouch’” is how MarketWatch put it so elegantly. It was ugly all around. A number of sectors, including manufacturing, shed jobs, and the labor participation rate dropped for the second month in a row, to 62.6%. Just about the only good number was the magic headline unemployment rate, which fell sharply, from 5% in April to 4.7%, the lowest since the Great Recession began, leaving some folks scratching their heads and searching for answers. The number of temporary jobs plunged by another 21,000. Temporary employment is a harbinger for future employment trends, on the way up and on the way down. The temporary-help sector was a major – and much lamented – driver of jobs growth after the Financial Crisis. The sector began adding jobs in September 2009. It was an early sign that companies were starting to hire again but didn’t want to commit to more permanent jobs, even as the economy overall continued shedding jobs until February 2010. This also happened in 2007, when the temporary help sector started shedding jobs even as the overall economy was still adding jobs until right up to the official beginning of the Great Recession. And it happened in 2000, before the 2001 recession kicked it. Staffing agencies are cutting back because companies no longer need that many workers. Total business sales in the US have been declining since mid-2014. Productivity has been crummy and getting worse. Earnings are down for the fourth quarter in a row. Companies see that demand for their products is faltering, so the expense-cutting has started. The first to go are the hapless temporary workers. 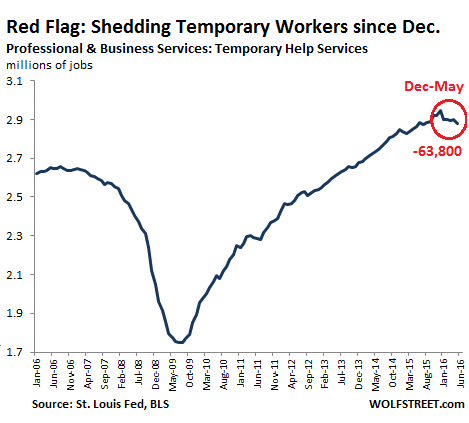 The decline in temporary workers isn’t just a one-month statistical blip, but a five-month trend: the sector has become a flashing red warning sign that the labor market is skidding even deeper into trouble. The meme that 14 million jobs have been created since the Great Recession is constantly trotted out as a sign of how the labor market has healed, but these folks forget to add a detail: since the Great Recession, the US population has grown by 16.5 million. Turns out, jobs growth was smaller than population growth! So per capita – for each of the 323.2 million people in the US – there are now fewer jobs than at the bottom of the Great Recession. And the US population isn’t about to stop growing, just because the growth in jobs has stalled and may soon start reversing. So this is going to make it a heck of a lot tougher for individuals out there in the job market. There have been other warning signs. But until recently, the official labor market metrics in the US — unemployment rate, number of jobs created, weekly unemployment insurance claims, etc. — have been immune to the worsening malaise visible elsewhere. This entry was posted in Dubious statistics, Economic fundamentals, Federal Reserve, Guest Post, The destruction of the middle class on June 5, 2016 by Yves Smith. Excellent points. Economists are, as usual, desperate to try to obfuscate reality because reality might imply that all is not for the best in this world and some action might be called for to improve the situation. I’m expecting a round of “revenue neutral” tax cuts and spending increases no matter who wins in November. It’s the only play the Powers That Be have in their book. They will, of course, accomplish nothing. Can we anticipate the much-anticipated Corporate Tax Holiday soon after the holidays? Not only that. Jobs that were paying say $50.00/hr when the crisis hit came back as jobs paying $20.00/hr or less. The published unemployment stats have no basis in reality. Most official unemployment numbers are carefully crafted fictions. Anything you can revise a month later to be 20% less than what you originally stated can’t have much basis in reality. That said, the steady downward trend of labor force participation gives a much clearer and more sobering picture: employment has been in free fall since the financial crisis. If you took care to understand how the surveys are conducted and how the stats are computed, you would not be surprised when they are revised. But the revision is not anywhere close to 20%. As the above commenters and the author point out, what good are absolute numbers when they are with respect to a pool that is growing? In a real science you’d get reamed for doing that. As that Cambridge economics prof pointed out, every eco decision is actually a political decision. And so the way they scale their data is a political decision. There are about 1.5 million immigrants a year. Does the 16.5 million population growth reflect that number also? If not, then we are down 6 million jobs since the end of 2007. Magic headline unemployment rate indeed. I’m surprised that we aren’t getting an annual employment report based on the current number of valid I-9s. The 1990s were hardly the “greatest ever growth in the economy ever”. 1997-98 saw the highest growth rates of that decade, 4.5, 4.5, and 4.7 percent, respectively. That might sound big now, but growth rates in the 1950s peaked between 6 and 8 percent, and in the 1960s between 5 and 7 percent, and even the lean years were far stronger than what we see now. By the 1980s, with the exception of 1983 and 1984 (~5 and 7 percent, respectively), expansion years saw growth of around 3-4 percent. In the 1990s, this became the “new normal”. Since 2001, the peak years were 2004 and 2005, with growth of around 3% annually — if we’re lucky. Most of the rest of that time, growth has been between 2-3% annually. By the 1980s, policy makers also became much more adept at camouflaging “good” and “bad” numbers alike, for political purposes. Notice what’s happened to the general rate of growth in the American economy over the last 60-70 years? The most obvious fact is the real working class run out of money long ago and resorted to credit cards and temporary jobs to survive. Now both are maxed out. I remember the “revenue neutral” tax of the Reagan Era. They took my revenue and gave it to the already rich and called it neutral. A question. What had happened to the unemployment claims series. Population growth alone should have pushed it higher, but instead it is trending lower. Why? Is it that eligibility for claims is declining because people have been unemployed for too long? Demographics and age related declines in the labor force? Any ideas? I believe unemployment claims are limited to those current eligible for unemployment benefits. Beyond that it gets more complicated: e.g. do you include everyone who is of workforce age but not working? If not who do include and who do exclude? I think it is because after people got laid off in the 2008 burn down of the economy many people couldn’t get hired again as full time employees. Only 1099 workers who do not get unemployment when they are laid off. OR they got hired and let go before they even qualified for unemployment, usually 6 months I believe, because that is the game employers are playing now so they don’t have to pay higher unemployment taxes. Either way they are not counted as unemployed when they get laid off again since 2008 burn down. Interesting and thanks. The scale of it has to be big cos we are now below the usual low point on claims and we have a much bigger population. My question is how much of the large debt being assumed by so many countries has to do with the decline of the American consumer? Yes Harry … One has to have a job that is eligible for UI in order to make a claim. That’s one reason why those who’ve been focused on this series have been fooled. To further clarify your comment: one has to have worked enough over the course of the year, earning evenly, in UI jobs to qualify. You can be screwed out of it by having one amazing quarter and 3 crappy ones or by not having a UI job the entire year. I work a supplemental UI job over the winter while running my own business the rest of the year so I am never eligible for unemployment despite any downturn or injury. I’m amazed this country has any entrepreneurial spirit left when policy sets you up to walk the tightrope of economic fuckery sans safety net. Do the powers that be (the 1%, and the politicians aiding and enabling the policies that benefit the 1%) think that the present (and for the past 30 years) economic situation is sustainable for an indefinite future? I will not see it (I am in my early 60’s) but at some point people affected will figure out that they have nothing else to lose and will take to the pitchforks in a manner that no one ever anticipated. Nearly everyone will say that cannot happen here, but this is same state of denial they exhibited for the past year when discussing Donald Trump. I don’t know. Your black population didn’t really do so much to complain about unpleasant treatment for ages. You can see why the authorities might assume there isn’t much to worry about. What with the militarized policing and the perfect electronic surveillance. One piece of advice. Don’t organise the protest on Facebook. The meme that 14 million jobs have been created since the Great Recession is constantly trotted out as a sign of how the labor market has healed, but these folks forget to add a detail: since the Great Recession, the US population has grown by 16.5 million. Turns out, jobs growth was smaller than population growth! It is indeed catastrophic when infants, toddlers, and young children do not have access to employment! I was waiting for someone to point that out. The relevant stat is jobs per working age population, not total population. In the former case 14M is totally reasonable, although it could certainly be better. Its not even the most lol-worthy of his statements. To this day I struggle to find a charitable reason for why he is linked to so often. Occasionally he makes a nice point, but usually its little more than marketing. I assume you have some links to prove that the current birthrate is outpacing 18 yo’s (or whatever year you start being counted) entering the workforce? Has not the participation rate for boomers increased, not decreased like for everyone else? How many employed people are there in the country today as compared to 2007? I am not sure what the the problem you are trying to articulate is. Population includes everyone regardless of whether they can/would work or not. Therefore, it doesn’t mean anything with regard to employment/jobs. Those 18 year olds you refer to were already counted in the population….so they don’t count in an increase in population (unless they immigrated) since 2008-2009. Same with all the baby boomers. Your concern about these two groups just shows you intuitively understand the point so precisely articulated by David… So why defend (maybe I am misunderstanding you?) Richter’s irrelevant proposition? I guess you ignore the people who age out of the system as well? The working age population growth tracks the population growth so the toddlers and infants remark is bupkis. “Age out of the system”…what a wonderful euphemism for death! I am not sure what your complaint is however. Population growth is evidentially irrelevant because population growth can occur without working age growth. If this was not the case, then newborns and children would (necessarily) be working age. Your point is a good one. The population has been growing, all right. But the prime-age workforce hasn’t grown as much. I think I saw a chart showing that the working population between 25 and 55 had shrunk quite a lot in the last 8 years. Which makes me think it wasn’t retirement doing the shrinking. Incarceration perhaps? Sorry, no. US pop is roughly 320M, labor eligible roughly 250M, job roughly 160M. So job to population roughly 1:2. So 16.5M population increase would suggest 8M jobs increase while we got 14. Per capita increase. According to BLS data, % of population over age 16 employed has dropped almost 5% since 1999, from 64+% to less than 60%. And this is not explained by aging boomers. This figures to at least 12-13 million jobs lost, from the high of 1999 boom to the present, in terms of current population.